Recently, the BD-NYC collaboration (me, Emily Rice, and Jackie Faherty) wrote an entire NSF proposal with Google Docs and it was AMAZING! In this post, I detail all the little things that we learned that will make it easier for you to get started using this tool. I’ve also whipped up a proposal template that shows off the final product and illustrates various techniques for figures and captions. The huge advantage of using Google Docs to write the proposal was that we could all work on the same document at the same time. There was never various versions floating around or emailing comments back and forth that would need to be laboriously incorporated. Instead, we highlighted sentences that we needed to discuss and left notes and comments directly in the text. You can even see the other people’s cursor and selected text so you can either avoid working on the same bit of text at the same time or watch another person’s edits in real time. A couple days before the deadline, we all edited and polished each other’s text. If we weren’t sure about the edit, we highlighted it and the used the sidebar chat to quickly come to a resolution. I think this simultaneous polishing by three different people got us to a high-quality final product extremely efficiently. Ability to upload a PDF and convert it to editable text. Yep, that’s right, turn a PDF into editable text. This was key for the Bio Sketches since a couple co-Is had existing ones that needed to be updated. Just enough formatting options. I find that with Pages or Word, I have too many styling options and spend way too much time fiddling. In Google Docs, there are just enough fonts and styles to choose from. Sidebar chatting. In the top right of the document, you see a list of the other people who are viewing the doc and you can initiate a chat right there. This was extremely useful in the final hours when we were all online at the same time. Mobile editing. This feature wasn’t released before the NSF deadline so I’ve actually never used it. Looks like it would work in a pinch on iPhone and Android, but would be totally awesome on the iPad. Always resize figures with corners to maintain proportions. Tweak the spacing: Format > Line Spacing > Add/Remove space before/after paragraph. BEWARE: Line wrapping in editor is different than in the PDF. We did references by hand. That is, we typed in “(Smarty et al. 2020)” in the text. I then created a custom template in BibDesk and just dragged and dropped to create the reference list (post forthcoming). Better pagination and accurate line wrap info in the editor. This can be very frustrating when battling with page limits because you need to generate the PDF to asses the length. Option to have chat beep when new messages are received. Customize the heading style formatting. Google Account required. Some collaborators may balk. Security/Privacy. (Full Disclosure: This is not something I give a crap about.) Yes, your documents will be in the cloud. Make sure you have a strong Google password and use the secure versions (e.g., https://docs.google.com/), especially if you are on a public network or unsecure WiFi. So, there’s the low down on using Google Docs for writing a proposal, or some other document collaboratively. Has anybody else done this? Please share other tips or advice in the comments. I’m also curious if anybody has tried it but ran into some problem that made you go back to the ol’ fashioned way. Now I can hear you all screaming, what about writing papers with LaTeX!?! That, I’m afraid is not as straight-forward. I’m looking into collaborative LaTeX options now and LaTeX Lab looks promising. If you’ve tried it, or found some other collaborative LaTeX solution, tell us about it in the comments. Thanks to Sarah Kendrew for comments on an early version of this post. I’ve tried Google Docs a couple of times for proposals, but some of the *ahem* older members of the team always had a strong resistance to it. It ended up being an emailed Word document. One reasonable compromise for those situations is to work on Google Docs until the last week, then you process it into LaTeX (or Word) and revert back to the bad old ways. I’m impressed at submitting the Google Doc PDF itself, though. Good for you! Re: a reasonable compromise. I totally agree that reasonable compromises need to be found but I think that the Google Doc was the *most* useful during the last week for all the tweaking. I would suggest that the compromise be switching to the Google Doc *after* the document structure and content is clear and everyone is just working on making it better, rather than making substantive changes. The last week is also when people are most likely to be working on it at the same time and Google Docs basically eliminates the need to “merge” these changes. LatexLab looks very interesting! Thanks for the tip. It seems like the Google command-line utilities (GoogleCL) could also be very useful here – it ought to be possible to write a little script to automatically re-upload your BibTex files and figures if they change, for instance. Thanks for the detailed tips on making Google Docs formatting work properly, which I have found frustrating after using LaTeX. Do you have any thoughts about using distributed version control instead for collaborative document preparation? It misses the nice feature of watching each other’s edits in real time, but does leave a nice record of everyone’s comments and allows the use of LaTeX still. The only thing I know about version control I learned from Tom’s recent series. I got the impression from the comments on Part II, that it might not be ideal for people to be working on the same document at the same time. But someone else should really weigh in here since I have no idea what I’m talking about and had a really hard time following that comment thread. This is fascinating! I’m eager to hear what people have to say about LaTeX, since, aside from papers, many telescope proposal rules require the use of LaTeX templates. Or maybe that’s a rule that should change? Any decent version control system will deal perfectly well with people editing the same text file at the same time (since after all, they was developed to allow programmers to do precisely that with source code). The only real gotcha is that most such systems look at edits on a line-by-line basis when it comes time to merge changes, so if two people edit the exact same line at the same time, generally you need to get a human to decide which to use for in the merged version. So in that sense, they don’t have the immediacy of Google Docs. But if you’re OK with just getting changes every, say, 30 minutes or so, and trying to not have two people work on the exact same sentence at once, then they’ll work just fine. 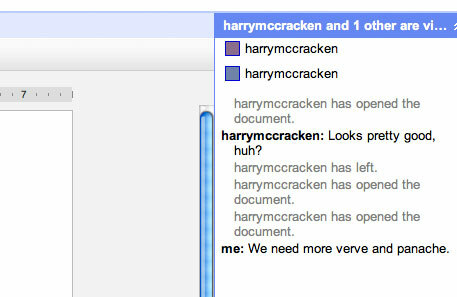 We sometimes edit on google docs and skype at the same time. We have had great results with this. One can talk and the other can write. No need to leave notes (but we do that also) you can discuss changes as you make them. My collaborators and I use Google spreadsheets for keeping logs during remote observing when we’re located at different institutions and controlling the instrument via VNC – we have a template logsheet for Keck NIRC2 and OSIRIS, and everyone can edit and see it during the night. @Bruce, that is a great idea. Any interest in posting the NIRC2/OSIRIS template logsheets somewhere for people to access? I can link to it from the wiki if you do. I haven’t had a chance to play with it too much. But I have just started a paper at the moment, and this seems as good a chance as any to step up and try it. BTW – one benefit of docs.goog that I haven’t seen mentioned in the post or comments is the backup inherent to the system. Google, and all it’s services (mail, maps, docs, etc.) are all backed up, probably much more safely and carefully than most of us run in the office with rsync, timemachine and so on. In fact, the goog’s policy is to ensure your personal information is never lost (never say never). So if you don’t have a disorder against a gmail account, and don’t have bad password habits, I would argue that google-docs might be one of the most secure routes for document use that exists today. Wes, hm, spartan-tex looks okay, but i dont think it has syntax highlighting since you just write the tex in google docs. I think Latex lab is the best option at this point: http://code.google.com/p/latex-lab/ If you do have a chance to play with one or both of them, please let us know how it goes! And totally agree about the whole backup thing. There’s basically no way you can loose your data! Course, you could loose *access* to it if you lost your internet connection…but that is just getting less and less common with the cellular data networks. I looked into LaTeX lab recently. While I agree it has promise, there is still no simultaneous collaboration possible. If you have multiple people working, you could work directly on the Google doc, but then would need to upload everything into LaTeX lab when you want to see how it compiles. In that regard, a better option is a freemium-style system called “ScribTex”: http://www.scribtex.com. Free for only two simultaneous users.